popular 1/16 scale figures to 1/35 scale. Finely sculpted 1/35 scale figure featuring all the intricate detailing of the 1/16 scale original. 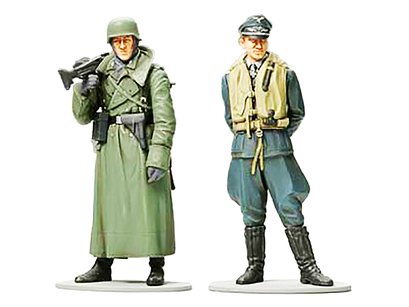 Figure is dressed in late-WWII greatcoat with MG42 machine gun carried on the shoulder. Large collar and cuffs come as separate pieces, adding to overall appearance. and colorful scarves often worn. Figure dressed in uniform as worn during the Battle of Britain. Figure has arms placed behind his back creating a natural pose. Can be assembled with or without cap.